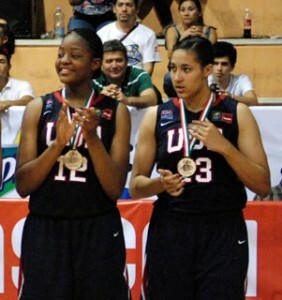 Rising juniors Stephanie Mavunga (Brownsburg) and Taya Reimer (Hamilton Southeastern) helped the USA Basketball U16 Team on their way to a Gold Medal win in the 2011 FIBA Americas U16 Championship on June 18 in Mérida, Mexico. The two were instrumental to the team’s success, with Reimer a five-game starter in the series and Mavunga providing significant help off the bench. Reimer averaged 4.8 points and 5.0 rebounds in 17.0 minutes per game for the USA squad. Mavunga was the most productive in her minutes, averaging a team third-best scoring average of 10.6 points to go with 6.4 rebounds in just 13.2 minutes per contest. The US recorded dominating wins over Brazil (71-54), Argentina (82-46), Venezuela (114-32) and Puerto Rico (99-51) before again facing Brazil in the championship final with a 73-40 win. Mavunga logged a double-double (12 points, 12 rebounds) against Argentina, 18 points and 7 rebounds against Venezuela, and 10 points and 8 rebounds in just 11 minutes of play against Puerto Rico. Reimer had her best outing against Venezuela, logging 10 points, 5 assists, 4 rebounds and 2 steals in 17 minutes. With the championship win, the USA secured a berth in the 2012 FIBA U17 World Championship games to be held in the Netherlands from August 17-26 next summer, along with runners-up Brazil and Canada.